There are dogs, there are dogs, and there are dogs. Three different kinds, and in this port drive all from your presence. 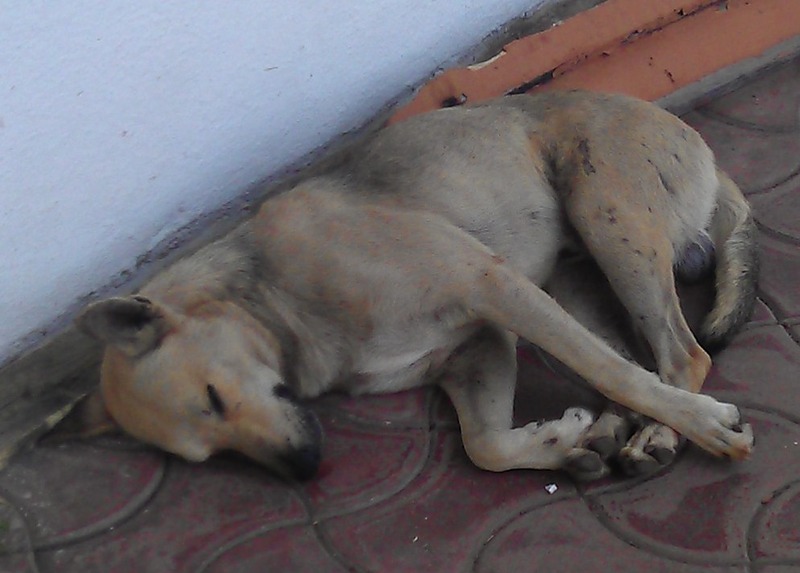 India abounds with dogs. White dogs. Brown dogs. Black dogs. 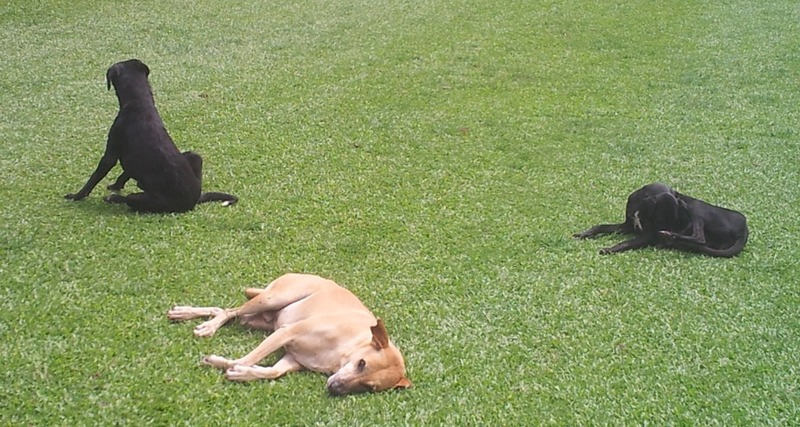 When I first came in Feb 2012 I asked one of my friends, “Who do these dogs belong to?” He patiently explained the dogs belonged to no one, they are wild and live on whatever they can find, or get. The little puppy I think was part of the family, but was more interested in nosing about than in napping. More than once playing at this club a pack of dogs has followed us circumspectly as we went from shot to shot. These dogs are – when not mixed with some modern European breeds – among the oldest known breed of dog. 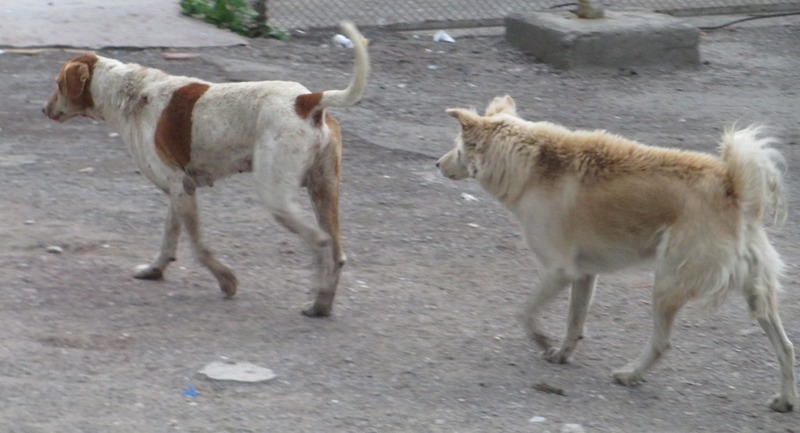 Called the pariah dog, or sometime INDogs, I don’t know how old as a breed they really are – 1000s of years, certainly – but they seem incredibly well suited to their environment and to living alongside humans in the cities and farm regions of India. 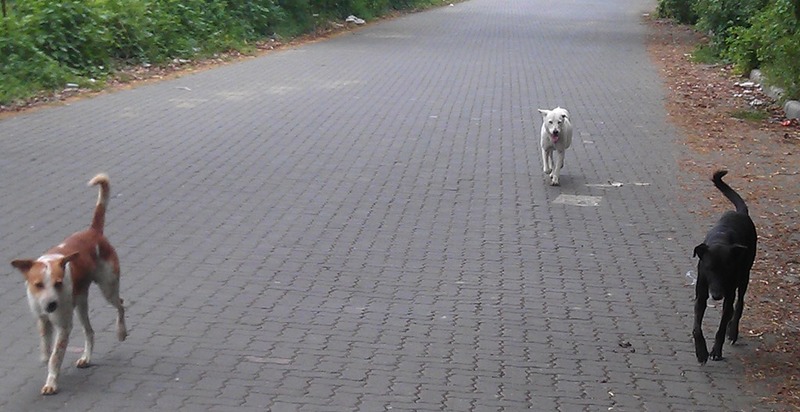 All the dogs I have encountered seem alert, inquisitive, and friendly. 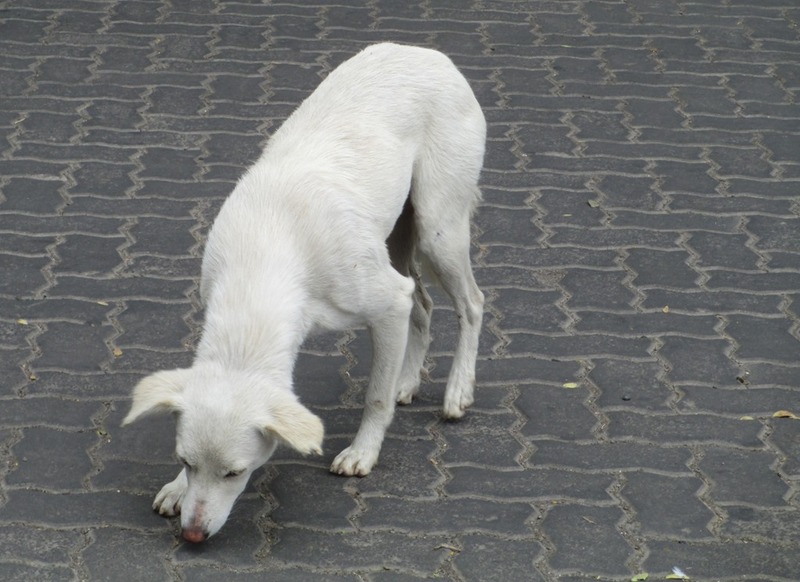 Many live by eating trash, though clearly some hunt small animals, like the vast numbers of rats that infest India. And people feed them, glad to trade a few scraps for a dog that will be friendly and challenge unfamiliar people coming to your place. Alas, many show signs of hard life. 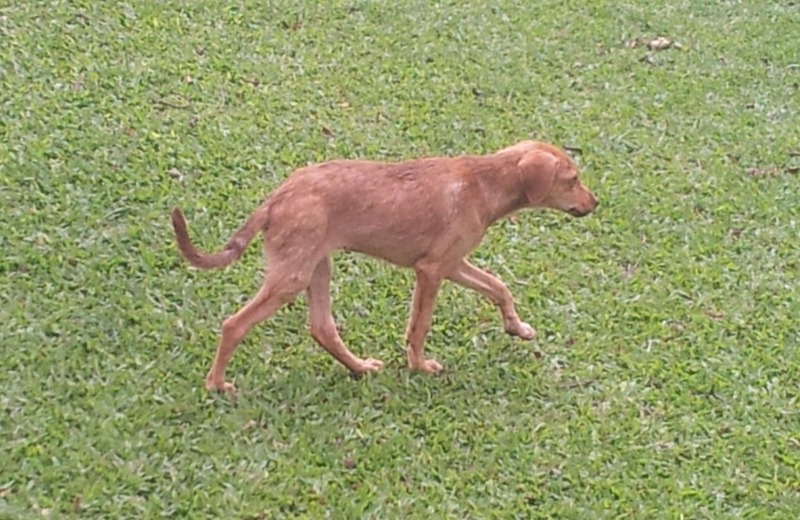 You will often see limping dogs, painfully thin dogs, dogs with mange, and dogs showing various wounds. Sometimes we hear dogs howling at night, and then the howling is transformed into the sharp and threatening growls of fighting. 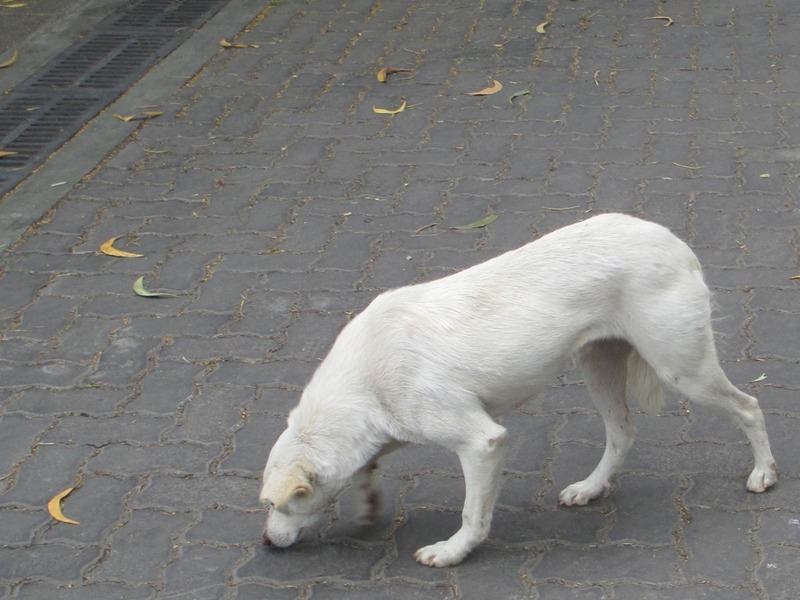 The many dogs you see with tattered or missing ears give witness to these nighttime battles. The wall in the left-hand pic is near to where Morgan waits for her school bus every morning. 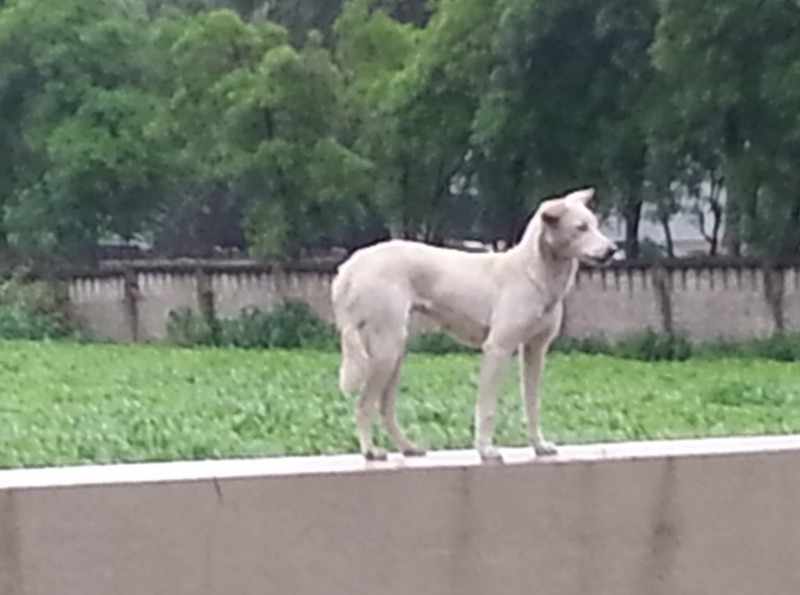 This white dog seems to like bounding atop the wall and surveying the surrounding area. Because of this ability to move up and down with ease, and also because of its friendly energy, Morgan calls it Bouncy. Rupesh likes it too … during the middle of the day Bouncy often sleeps underneath our car. Kim and I sometimes call Bouncy another name: the White Mouser, because Kim has seen it catching small creatures … hopefully, rats. Made a day trip to Mumbai today … Destination: US Consulate. Mission: Get visa pages added to my passport – out of the standard allotment of 20 I had only 4 remaining, and many countries will not even admit you if you have a such a small number. Our considerate and efficient consulate added 48 pages while I waited, even sewing the new booklets securely into my passport. But first I had to get there. The monsoon is continuing uncommon long this year, at least in Maharashtra. 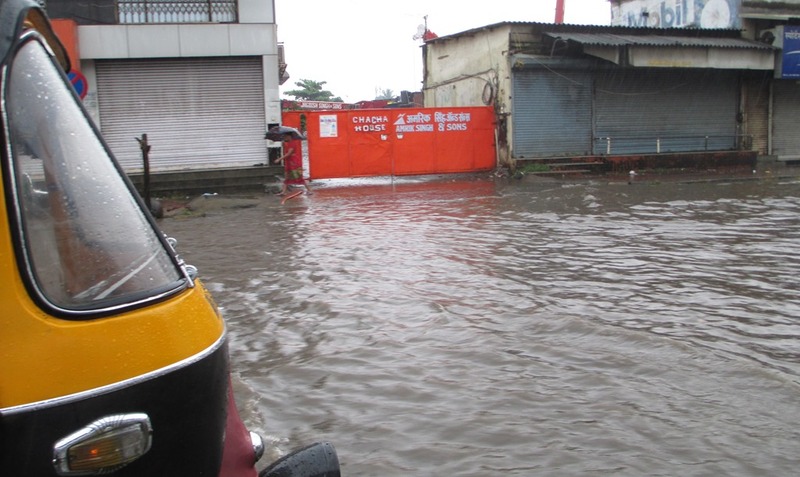 We encountered heavy rain on the highway part of the journey, but in the city had to slog through many places like the above, where water was at least 10” deep and not apparently going anywhere. The door to door trip from Pune to Mumbai of about 150 kms took about 4 1/2 hr, some 45 mins more than it usually would – said time being spent slowly inching around these new lakes and keeping to the safe coastlines … because when a Mumbai road is involved, you never know what lurks beneath the surface. My little Canon Powershot A4000 is a great all-around tourist camera, but isn’t that good for low-light close-ups – this was the best I could do capturing this visitor to our flat vestibule. About 4.5” in length – a veritable Hummer of a bug – I was taken by how leaf-like the wings were. I’m a live and let live kind of guy, and so long as these hefty emerald Tettigoniidae don’t swarm excessively, destroying Pharaoh’s crops and the like, I’m good. But I did want to find out some details on this specimen, like what species it was. Dunesh Gankanda, a United National Party Member of Parliament from the Ratnapura District walked in to The Museum Club at the Galle Face Hotel around 1.30 am on Sunday with a friend, Capt. Senaka De Silva, a close aide of General Fonseka. Present at the night club was a Tamil businessman, Diwakaran, entertaining a group of foreign clients. Senaka knew Diwakaran and walked up to his table to say ‘hello’ and then introduced Dunesh. Diwakaran invited both to join his table. Dunesh initially made small talk and then broached the topic of Raju Radha, ex-husband of Dunesh’s wife Kushani Nannayakara. She is the daughter of Capt. Nanayakkara and Mrs. Norma Nannayakara of Green Lanka Shipping Ltd. and has two children from her marriage to Raju. Raju Radha, the son of the famous Indian actor M R Radha, is the owner of HRC Shipping and other businesses. His sister Radhika is also a popular Indian actress. Their mother is Sri Lankan. When Diwakaran said he knew Raju well and Raju was a relative – out of the blue Dunesh lunged forward, bit Diwakaran’s nose and then disappeared into the crowd in the night club. Diwakaran was shocked and did not react at all. Bleeding profusely and in pain Diwarakan was rushed to the General Hospital, Colombo where doctors performed surgery on his nose. Some of these crimes are amusing, like “GOVINDA (INC), Age: 41, From: Mumbai North, MAHARASHTRA; Defamation, obscene acts and songs”. Sounds like Govinda needs a nightclub booking, not a court date. Of course. “big” == “Big Bang Theory”, “india” == “Raj Koothrappali” (the show’s Indian astrophysicist), and “grasshopper” == Raj’s favorite drink. Ok Google, you win. Don’t know what species my bug-visitor actually is, but far as I’m concerned it is Tettigonia magnus viridis bharati – big green Indian grasshopper.